Our Alder Chunks are larger in size, about 3" square to burn longer for larger custom smokers, barrel smokers, and grills. These chunks can work well in larger Weber`s and porcelain grills also. Our equally even sized chunks burn more even and predictable for consistent cooking letting you produce a gourmet meal every time. 18"x12"x12" box of wood. 1.5 Cu. Ft.
Total Weight will be close to 32lbs. 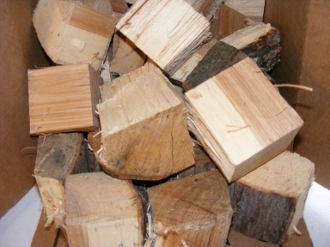 Alder is a very light weight wood compared to other woods.